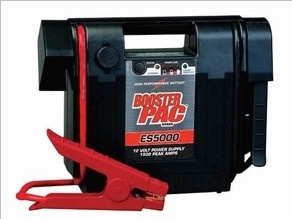 1500 Peak Amp 12 Volt Jump Starter Bring on the power! With a high performance battery and up to 1500 Peak Amps, the ES5000 is the Booster Pac for professionals who need serious starting power. Multiple jumps between charges and 43" cables make the ES5000 as convenient as it is powerful.